Seriously, it’s been below-zero for a week. Nothing new for Minnesota, just a particularly harsh reminder that holiday and birthday fun are officially over, welcome to real winter. 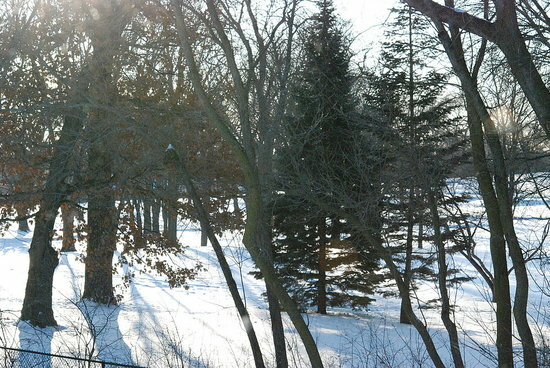 Forget the fluffy snow-twinkly light-wrapping presents-sledding winter. No, this kind of cold is way beyond the warming reach of hot cocoa. This is ugly, mean, dangerous cold, the kind that every year has me asking…WHY DO I LIVE HERE? Sigh. I’ll stop now. And make the best of it, as I always do, by whipping up something warm and comforting. 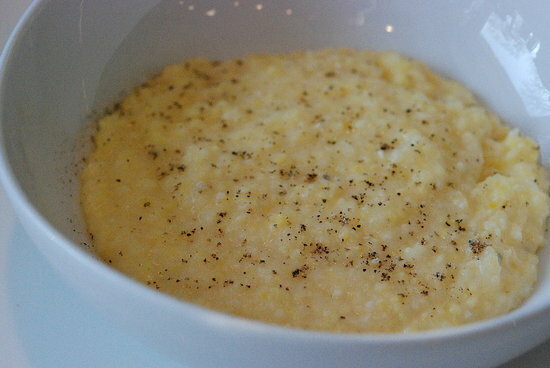 Peasant-style food works here, in today’s case humble polenta. 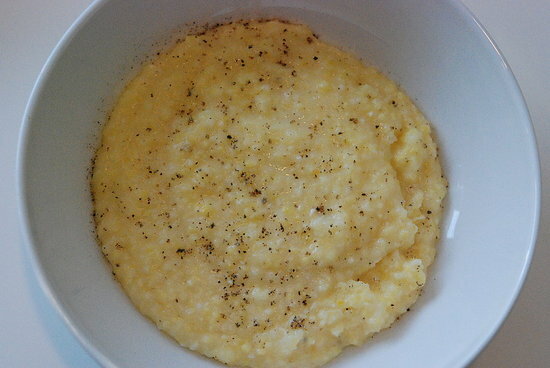 Or spectacular polenta, as it were, with just a kiss of butter, a sprinkle of salt and pepper, and either a generous shower of grated Parmesan cheese or – my breakfast this morning – an over-easy egg. The trick with polenta is to cook it for a long time and give it several good stirs, that’s what makes it creamy-dreamy without a drop of cream (although go ahead and add cream if you wish, you certainly won’t regret it). Follow this recipe, tonight perhaps, and serve it alongside beef stew, or grilled lamb chops, or roasted vegetables, or even just sauteed mushrooms. Sauteed greens are particularly delicious (think collards & grits and you get the picture…). Make a big batch, eat the first round porridge-style, then eat the leftovers sliced and sauteed or grilled (since it becomes quite firm upon cooling). On a slightly different note, here are two healthy, comfort-y recipes that could be nice for the weekend – green salad with warm potatoes, and frisee salad with an egg (perfect brunch food, add a glass of bubbly; they leave off the traditional bacon/lardons, but I submit that a very small amount of bacon packs a big flavor punch, so go for it if you think you’ll miss it). Later note, February 14, 2010: Mark Bittman/NYTimes has a similar rave, plus a video, check it out.